SAN FRANCISCO--(BUSINESS WIRE)--Womply, the leader in front office software for SMBs and leading software partner to the credit card processing industry, today announced the results of a study which concluded that merchants that used Womply Insights had 17% lower attrition than those who did not. Womply’s data science team recently studied the long term impact of deploying their merchant-facing Insights software across acquirer and processor merchant portfolios. The study looked at over 400,000 merchants from more than ten of Womply’s partners over the past three years. After controlling for other factors, the study concluded that merchant portfolios that used Womply Insights saw an average 17% reduction in attrition, as compared to those that did not use Womply Insights. 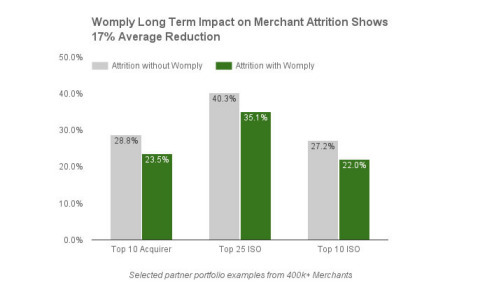 As shown in the graph, three representative examples show the impact that Womply Insights had on merchant attrition across a wide variety of partner portfolios. A Top 10 Acquirer saw attrition drop from 28.8% to 23.5% (an 18.4% reduction), a Top 25 ISO decreased from 40.3% to 35.1% (-12.9%), and a Top 10 ISO moved from 27.2% down to 22% (-19.1%). Merchant attrition is one of the biggest issues facing the merchant acquiring industry. Many companies have already set plans in motion but realize the scale of the issue means there will not be an overnight solution. Interviews with merchants suggest three major reasons why Womply Insights makes them more likely to stay with their acquirer. First, Insights helps merchants grow their business, which is a valuable benefit they don’t get from most acquirers. Second, once merchants start using Insights, inviting their staff, and contributing their own data, they don’t want to leave that investment behind. And finally, Womply’s deployment of Insights enhances the acquirers’ brands, which has been measured with improved NPS scores. Together, these factors make it harder for low priced competitors to get a foothold. Womply Insights is viewed by the merchant as a value-add instead of as a utility. If you’d like to learn more about this study, contact our Partnerships team by email at partnerships@womply.com or visit our website. Womply is a software-as-a-service (SaaS) provider to small and medium businesses. Our mission is to use technology and data to grow, protect, and simplify small business. Every day we serve tens of thousands of merchants, across 400+ business verticals, in every corner of America. Announcing results of long term study related to merchant attrition within the payments industry.